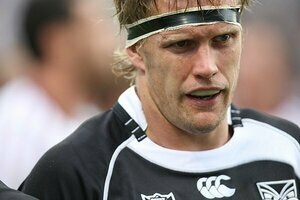 Warriors captain Micheal Luck on the verge of announcing his retirement. The 220-game veteran and club vice-captain - who is off contract at the end of the season - has been offered a one-year extension, however the Weekend Herald understands he is considering calling time on his playing days to take up a coaching position, most likely with an Australian club. Luck did not respond to messages left on his mobile phone yesterday. Warriors chief executive Wayne Scurrah confirmed the club met Luck and his agent Jim Banaghan this week to discuss a contract extension, but he would not discuss specifics of the negotiation. However, it is understood Luck has indicated he may instead opt to retire because of concerns about his body's ability to cope with much more punishment. Luck turns 30 today. He has undergone four surgeries - two on his broken hand and one each on a shoulder and finger tendon - since last November's grand final. He is yet to play this season but recently had a cast on his damaged arm removed and is expected to return to the field around round 11. The Warriors consider Luck to be coaching material and are keen to keep him in an off-field capacity if he does retire. The Weekend Herald was unable to confirm a report he had already put his house up for sale, but it is understood Luck's preferred option is to return to Australia. In his seventh season with the Warriors, Luck has played 144 matches, scoring seven tries. If he does retire it may have a knock-on effect on the club's recruitment plans. A veteran presence in the middle of the defensive line, he will not be easily replaced. Just on Luck, I'd be keen for him to take up that extra year option. Elijah looks to be the obvious replacement, but he's only an apprentice tacklebot, he needs the master to stay around a bit longer to teach him. Nah I'd wish him well if he did hang up the boots, but it'd be a blow. It'd free up a slot for Benry to return to the backrow, oh wait he's our best centre. I hope they do manage to keep him on board in a coaching role if he decides to retire. Defense or 'putting pride in the jersey' coach maybe? Panthers sniffing around for a new support coach, perhaps? Wonder if he'll want to go to the Mountains or back to QLD if he does go. hmmmm not great news is it? Weird if he retires at 30.. he's got another couple of years in him at least! You mean he's definitely retiring at the end of the season? And don't we already have a replacement? To be honest, I think it would be going backwards to look for a like for like replacement. If we are looking for a replacement lock, I think we should be looking for the best possible one in the market, not the one that fits Luck's game closest. So what do our second row stocks look like now? With Brown and Luck leaving I think we're getting somewhat short. We'll have to take a bit of a punt on Ikahihifo, Sam Lousi or Taukeiaho (which I'm all for). Hmmm. Mixed emotions. I've only just started appreciating his real value in the past couple years and now he's gone. Don't really know if we need a direct replacement for him though. A backrow of Mannering/Mateo/Taylor looks like the best option to build on, Benry could cover Mateo when he comes off, the other two are 80min players. Plenty of options coming through the system. I hope you stay with the Warriors, but all the best no matter what you choose. Dont really want to see the guy go. But just going through his past injuries in that article you can see why. At least his house near Eden Park will sell for heaps. He made an announcement at training this morning to his team mates that he's retiring at seasons end. As well as his body falling apart, he said he wants to move his family back home to Townsville. He'd be a great defensive coach, can't see him getting a gig at Cowboys though. Peter Ryan is their defensive coach and arguably the best one in the NRL. Probably why he said if his hands not right he'll play with pain. Sad to see him go...our backrowers are falling off the shelves..Sharky now Luck. Who's next? Mateo doesn't re-sign? I think mannering should take his place. good luck luck! Bit of a shame, would love to have Lucky round the scenes for another season or 2, just for experience and his hard nosed attitude on the field. So do you guys reckon we should go into the market for another forward? I think we are ok with props, but experienced second rowers stock will only be Mannering and Mateo. Im not sure if the guys coming through will be up to make up for sharky and Luck. I think if we get rid of Ropati (though I've heard we want to keep him.....) we should go for an experienced big named centre, maybe Lyon (Could kicks goals as well). We need a tackling machine. Taylor seems to be keen for that, as does Friend. But they both aren't as effective as the Truck. Has Steve Rapira officially been turned into a prop?